Switzerland has unveiled a list of specifications for the country’s future combat aircraft and ground-based air defense system. The Swiss defense department said Friday its NKF combat aircraft should be able to protect the Swiss airspace and perform routine air policing missions continuously. The country is looking for an aircraft that can respond within minutes to violations committed by manned or unmanned air vehicles in the Swiss airspace. NKF should also have the capacity to coordinate with ground-based air defense systems in mitigating enemy air attacks through operational firepower and air reconnaissance. 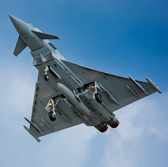 The aircraft fleet needs to be large enough to conduct normal air policing operations and training; maintain four aircraft on patrol for at least four weeks; and carry out air reconnaissance and strike missions. The Swiss military will consider Airbus‘ Eurofighter, Dassault Aviation‘s Rafale, Saab Group‘s Gripen E, Boeing‘s F/A-18 Super Hornet and Lockheed Martin‘s F-35A fighter aircraft for its new combat plane. Switzerland wants its Bodluv ground-based air defense system to be able to disrupt targets in the medium and upper airspace within a range of at least 5,800 square miles. Bodluv needs to operate continuously when there is a sustained cross-border flow of materiel and maintain operations for at least six months when materiel supply is not assured. The candidate systems for Bodluv include Eurosam‘s SAMP/T, Rafael Advanced Defense Systems‘ David’s Sling and Raytheon‘s Patriot missile defense system. Switzerland will evaluate the combat aircraft and air defense systems based on procurement costs and the costs of operations for 30 years.